Why Do You Need a GMAT Waiver Letter? So what is a GMAT waiver letter in the first place? The GMAT or Graduate Management Admission Test is often a requirement for admission into a program such as an MBA. It is a test that can be taken in many different centers around the world and is administered to prove your abilities in this area. Not everyone, however, has the skills to take this test, especially if they have been out of education for a length of time and are nor used to exams and testing anymore. Many programs, therefore, will allow you to waive this requirement as long as you can demonstrate your abilities in another manner. Typically this will mean that you already have a post-graduate degree, professional certification or have many years of work experience within which you can demonstrate continued advancement. Not every program will allow a waiver however and each has very definite requirements, so you should always check before you write and send your letter. If you have no idea how to create a GMAT waiver letter, you may use our experienced personal statement writer for hire. Please, check the sample and make sure you came to the right place. GMAT or Graduate Management Admission Test is the way to judge the competency of an applicant for securing admission into the MBA program. Do I need to clear GMAT for getting admission into MBA? If you have recently cleared your graduate degree and have no further qualification, you must have to clear GMAT for getting admission into MBA. 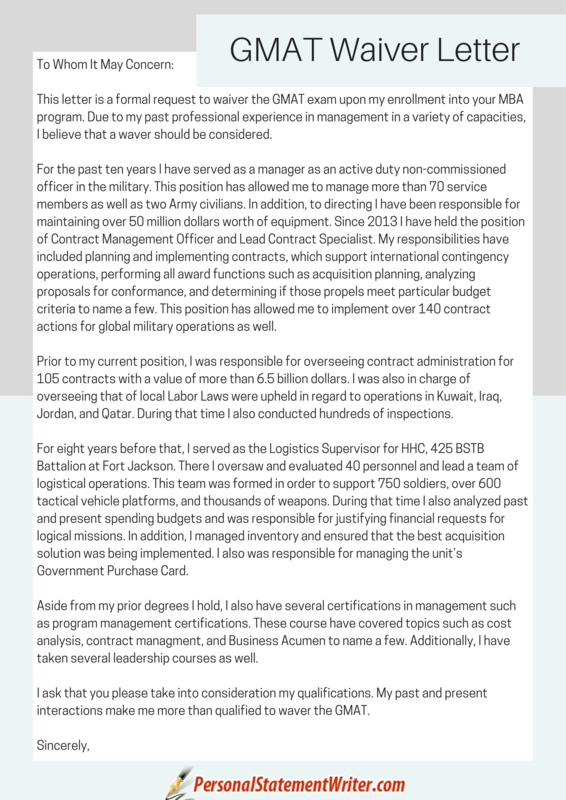 A GMAT waiver request letter sample can help me up to what extent? A good GMAT waiver request letter sample definitely can help you in writing a winning waiver letter. How to write a good GMAT waiver letter? Writing a good GMAT waiver letter means, you have to take care of standard format and rules for writing a waiver letter. There is no space for any error or mistake. Who can help me in writing GMAT waiver letter? 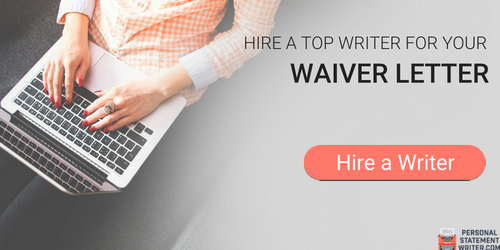 A good online writing company who is offering services of professional writers to write guaranteed error-free, customized and winning GMAT waiver letter can help the students who want to save them GMAT. Can a GMAT Waiver Sample Help You with Your Writing? Samples are often the best way for you to see what is expected of you. Our sample waiver letter lets you see precisely how your own letter should be structured, the areas that should be covered, and even the tone that should be adopted. This allows you to better understand what you need to do with your letter. Do not just simply copy the letter that we provide, however, it is not going to reflect your personal reasons for wanting to have a waiver granted. If you are worried about writing your GMAT letter requesting a waiver our experts are here to help you. Our services have helped many other students in your situation to write successful waiver letters. They are post graduate degree qualified and only help students in the area in which they hold qualifications and have experience. 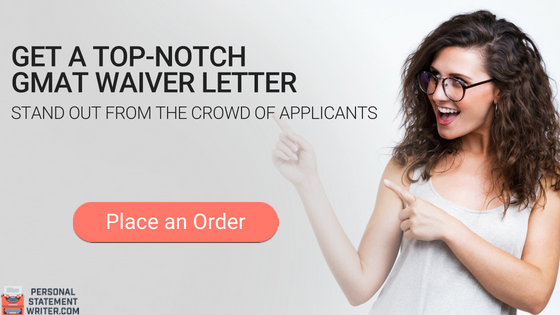 They will work with you to gather the required information to write an effective and persuasive letter that will fully satisfy your expectations. So if you want to submit a GMAT waiver letter confidently just get in touch with our experts today for the support you can trust fully. We hope this sample was useful for you. You can use a waiver letter template to write your own letter, as well as compare 500 or 250 word personal statement samples to check the strong points of each. First, review a winning GMAT waiver request letter sample and then order us to write the same one in your desired time limit and highly affordable price with enjoying the amazing discounts!